For the adventurous mountain trekker, few destinations are more magnetic than the Himalayas. Their towering peaks and glaciers represent the ultimate experience in mountaineering, and for many a journey into the Himalayas is really more like a pilgrimage. Three major regions of India penetrate the Himalayas, all of them exceptionally beautiful. In the far northwest there is the province of Jammu and Kashmir, and a gorgeous region known as Ladakh; in the northeast are the provinces of Sikkim and Arunachal Pradesh. More than destinations for just mountain climbers, these regions are culturally rich, often dotted with temples and monasteries. Those traveling to the Himalayas should keep in mind that they will generally be at very high elevations, and therefore prone to the dangers of altitude sickness. The rule of thumb is to always allow time to adjust to the heights, taking it slow. Warm clothes are also necessary. One of the most remote and mythical regions of India, Ladakh is a landscape of unearthly beauty. Carved through its center by the headwaters of the Indus River, Ladakh sits high in a Himalayan valley between the Ladakh and Zaskar ranges, close to the Chinese border. The wall of the Himalayas blocks precipitation, and the resulting terrain is dry, barren, and poetically austere. Life here has remained virtually unchanged for thousands of years. Ladakh's biggest attraction are its ancient gompas, or Buddhist monasteries, which contain some of Asia's greatest wonders of gold and tapestry work. It is possible to stay overnight in some, making a trek in Ladakh curiously like a sort of pilgrimage. The people of Ladakh, many of whom are Tibetan refugees, are famous for their friendliness and hospitality. For the mountaineer, the nearby Zaskar range offers some fantastic and challenging hiking opportunities. A variety of long, mid, and short range treks, which follow rough trails and pass through some spectacular high-altitude mountain passes, connect the region's gompas and villages. It is important to note that visitors to Ladakh should take time to adjust to the high altitude. Altitude sickness here is very common, and the best way to avoid it is to do very little for the first couple of days in the region. Summer is the best time to come, as heavy winter snows make make it very difficult even to get to Ladakh. Darjeeling sits at the crossroads of the eastern triangle corridor, a hidden stage of foothills in a geographical amphitheater that looks up into the mountainous wonderlands of Nepal, Tibet, and Bhutan. Darjeeling's name is a variation of Darje Ling, which means "place of the thunderbolt" in Hindi. According to the Lamaist religion, this is the site where the god Indra's scepter (a lightning bolt) fell to earth. While Darjeeling is a place of mythical significance to its people, its value was primarily practical to the British as the strategic gateway to Nepal and Tibet. Darjeeling also offers a cool escape from the dust and sun of the plains below, and the British started to develop the region as a summer retreat shortly after they arrived there in 1828. Darjeeling soon became a haven for tea growing as well, and its cool and misty tea plantations are among the most idyllic attractions in India. The city of Darjeeling offers one of the most dynamic mixes of culture on the subcontinent. Tibetan Lamas can be seen climbing the steep streets in their yellow robes, alongside Sherpas, Gorkhas, Gurung farmers, and people from a host of other cultures and regions. The high-quality trails surrounding Darjeeling and its tremendous views make it an ideal locale for hiking. A leisurely four day hike to the top of Mount Sandakphu (3536 meters) is rewarded with an astounding vista of the Kanchenjunga Mountains and the highest mountain in the world, Everest. Alpine meadows and wildflowers can be seen on this trek, and there are bungalows and field camps en route. Powerful Rapjut princes once ruled this desert region, which no foreign invader was ever able to dominate. The natural adversary of the environment provided the adaptable Rapjut with their best defense, though they supplemented it by building magnificent fortress palaces on the wind-blown sands. The desert ruins of the Rapjut can still be visited, as can the Thar's remote temples, village oases, and hyponotic, swirling sands. 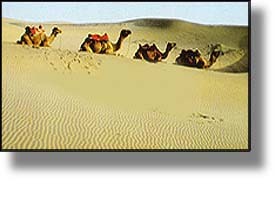 The Thar is best experienced by camel safaris, which leave from Khuri village. There are day treks that leave in the morning and return at night, or arrangements can be made for longer trips. Because of the immensity and harshness of the desert, all those who voyage into it are required by law to have a guide. Many assert that the Taj Mahal is the most beautiful structure in the world. Resting like a rose and ivory dream on the banks of the River Yamuna, the Taj is a gigantic monument inspired by love. It was built for the Mughal emperor Jehangir, who vowed to create an incomparable memorial to his wife, Mumtaz Mahal, who died after they had been married for 19 years. Built by Shehajehan, son of Jehangir; the Taj took 20 years and 20,000 workers to build. To house all the workers, an entire community rose up around it, and the descendants of those workers still live in the shadow of the Taj today. The main structure, with its perfect spires and domes, is made of white marble and sits on a red sandstone ramparts circled by reflecting pools and gardens. Inside the building is an astoundingly ornate burial chamber where Mahal and Jehangir now rest, surrounded by jewels inlaid in white marble and craftsmanship of unrivaled detail and intricacy. One of the India's best parks, Bandhavgarh is located in Madhya Pradesh in an area which once inspired the setting for Rudyard Kipling's Jungle Book. 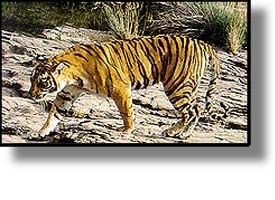 Bandhavgarh is one of the best places to see tiger--at one time, before the park was enlarged, it had the highest density of tigers anywhere. The park also holds panthers, and an abundance of bird species flit through the rainforest. Situated in a swampy region of Rajasthan, Keoladeo Ghana is a wetland of avian wonders. During monsoons, much of its twenty-nine square kilometers flood, providing a home to India's largest native population of waterfowl. Beginning in October, flocks of migratory birds arrive from all over Asia, some of them coming from as far away as Siberia to escape the frigid northern winter. This page, and all contents of this Web site are Copyright (c) 1997-2005 by InterKnowledge Corp. All rights reserved.